Meg Martin joined the online team of the newspaper as a multimedia producer in 2007, after spending two years at The Poynter Institute – first as a summer writing fellow and later as a fellow and editor at Poynter Online. A Pittsburgh native, Martin graduated from the University of Notre Dame in 2005 with a degree in English and a focus on oral storytelling and family narrative. 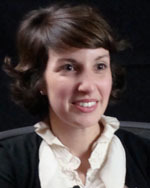 She’s a member of the Online News Association, the Society for News Design and the Appalachian Studies Association.